Over the past 30 years, conflict between countries has become relatively rare; however intrastate conflict – civil wars, territorial disputes, and insurgencies - remains a persistent global phenomenon. 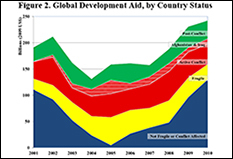 The United States has distributed more than $200 billion in development assistance between 2001-2010, with the vast majority disbursed to conflict-affected states. New research at the University of Maryland seeks to leverage major advances in information, technology and methodology to better understand the relationship between aid and conflict. The project 'Aiding Resilience? The Impact of Foreign Assistance on the Dynamics of Intrastate Armed Conflict’ has just received a $2.5 million grant from the Minerva Initiative of the U.S. Department of Defense to study the association between development aid and the likelihood, escalation, severity, spread, duration, and recurrence of violence, spanning the phases before, during, and after armed conflict. The Minerva Initiative is a program to support university-based social science research that was launched by the Secretary of Defense in 2008. The goal of the Initiative is to bring together universities, research organizations, and individual scholars to improve the DoD's basic understanding of the social, cultural, behavioral, and political forces that shape various regions of the world. Because two of the initiative’s key objectives are to develop foundational knowledge about sources of present and future conflict, and to understand the economic contributors to stability, the ‘Aiding Resilience?’ study is of particular interest.